Gross. Right? I mean who wants to sit that close to anything that might have inadvertently sucked up droplets of someone else’s pee? My Great Aunt has one of these on her toilet. Myself, I have yet to actually see it but my mother swears it exists and her tall tale of woe from her last visit was enough to ensure that a.) I would voluntarily have a catheter inserted before visiting or b.) again, voluntarily, agree to piss outside in the middle of her driveway … even it means I’d have to drip-dry. Yes. Yes. I did agree to drip dry rather than sit my hiney on one of those furry seats. BUT. (No pun intended – really – I swear!) Here’s the thing … today – probably a good 4-5 times, I have (gulp) secretly wished my toilet was covered with one of those furry seats. OK. I know. 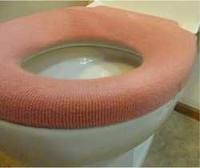 Nobody wants to know about anyone else’s bathroom woes but in all seriousness this isn’t a woe-is-me tale … consider it more of a quest to find someone who wants to go into business and fund a macrobiotic, NO GERMS LEFT BEHIND, toilet seat cover – preferably a warm fuzzy one. Previous Who needs water anyway? ?